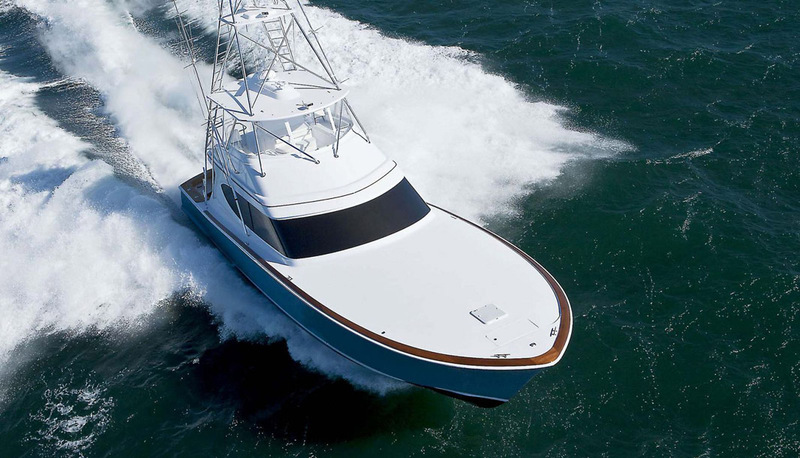 The Hatteras GT63 is a classic Carolina-style convertible sportfish accented by an aggressive bow flare and low foredeck, but no one is building this style of tournament-ready in a more modern and innovative fashion other than Hatteras. 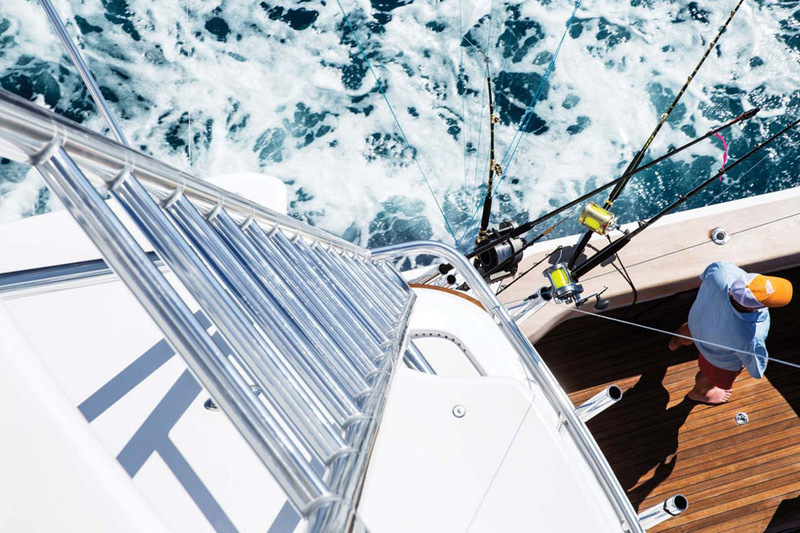 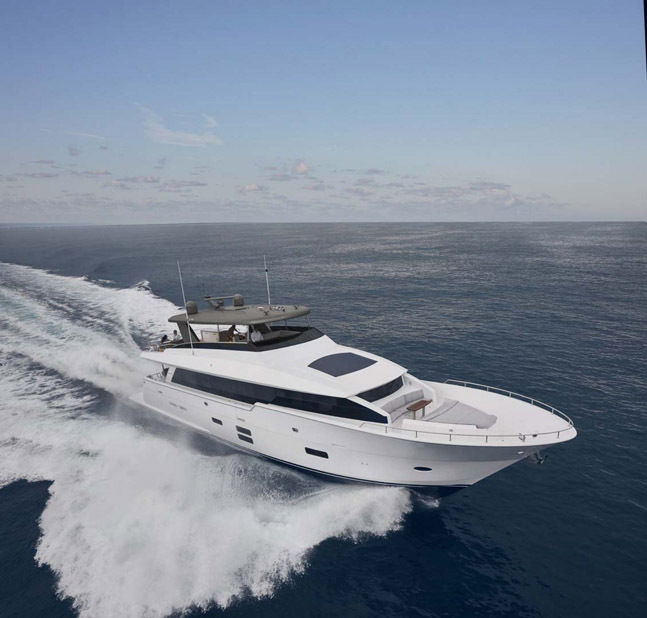 The new GT-series from Hatteras has caught everyone’s attention with its speed, Hatteras-renown durability, ‘fish-ability’, and interiors that take cues from the motor yacht range. 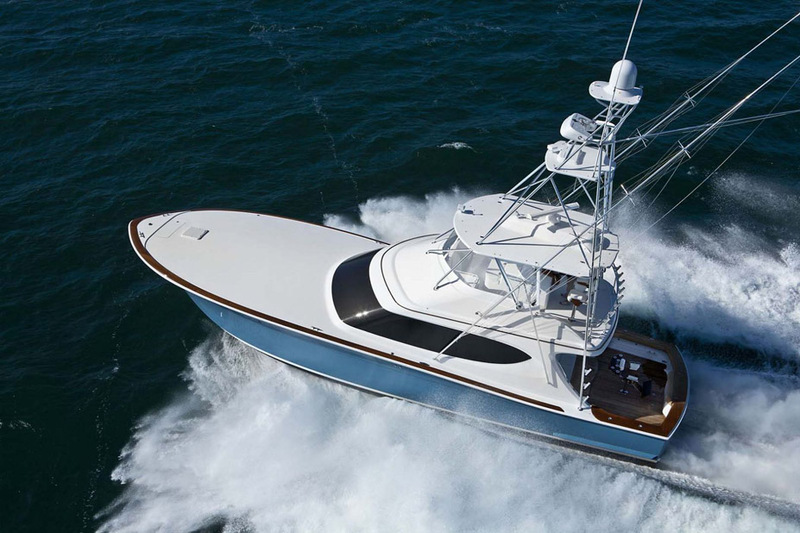 The Hatteras GT63 is both fishing machine and comfortable cruising boat, all while looking classically Carolina-esque. 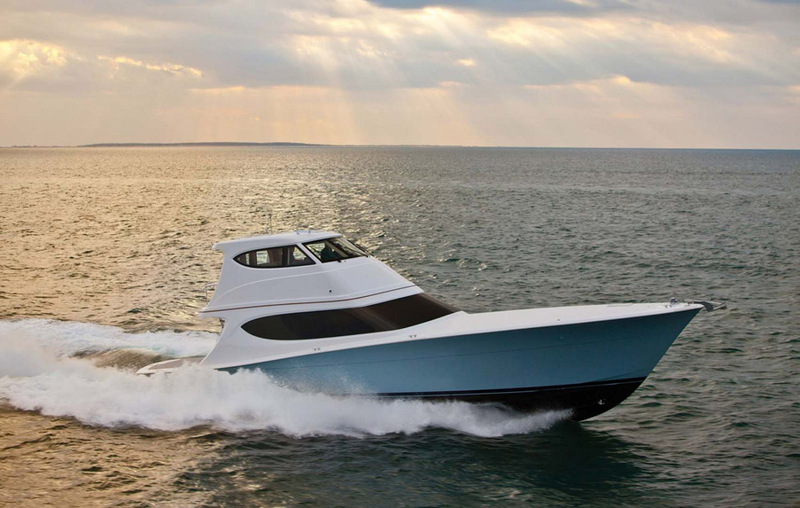 Building a tough, durable boat that is able to exceed speeds of 40-knots requires ingenuity and innovative techniques that the factory in New Bern, North Carolina prides itself on.  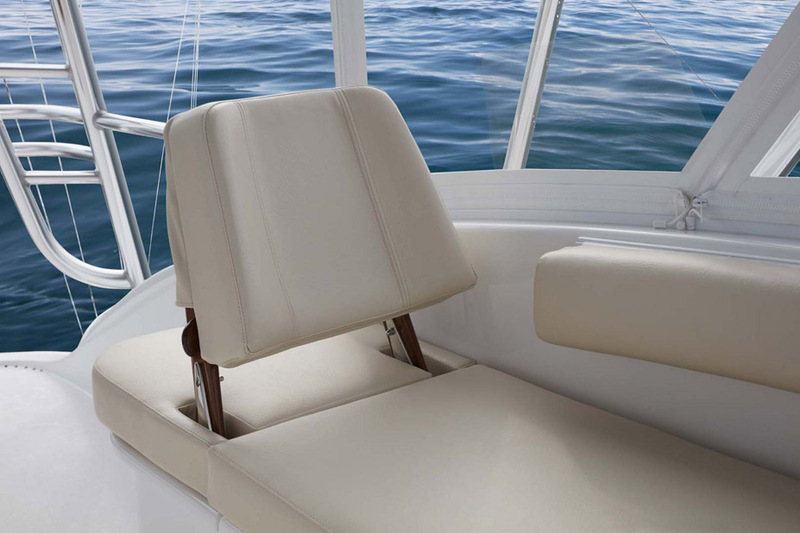 The hull is balsa core, except for the bottom which is solid fiberglass. 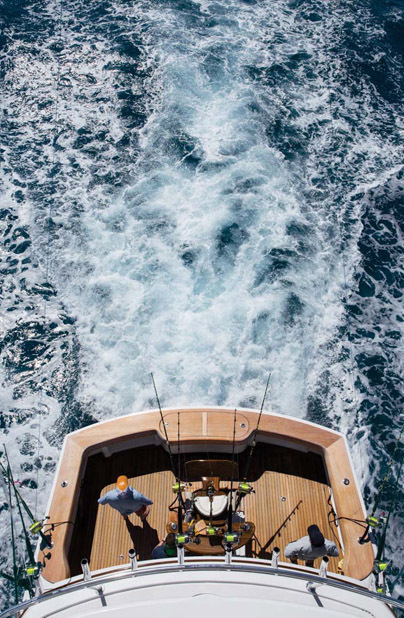 While this does add some weight, it also makes the bottom much stronger than other sportfish in its same size range. 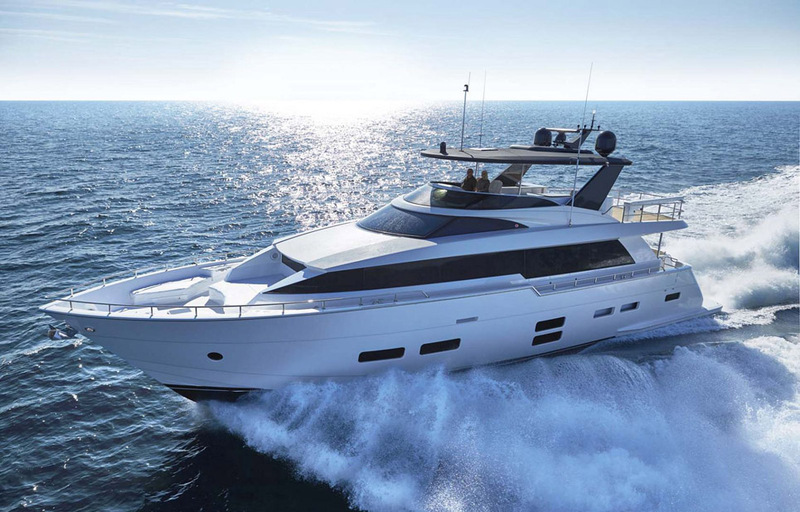 The hull above the waterline uses a closed cell foam core with a 60% glass to resin ratio which is vacuum bagged to remove all air from the foam. 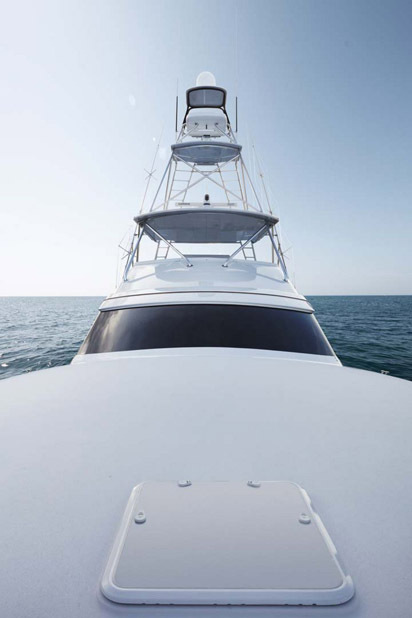 The result is a stronger, lighter deck and hull which increases durability and performance. 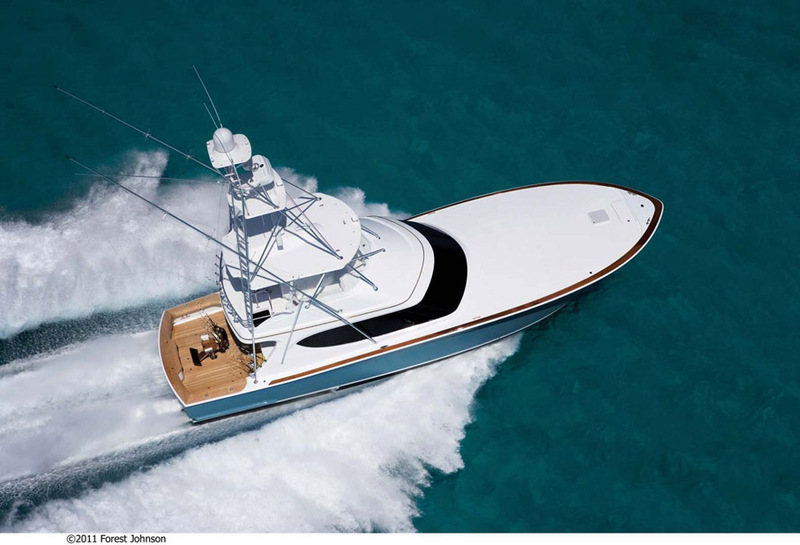 Additionally, Hatteras designed the props to fit into a recessed pocket in the hull which run completely back to the transom. 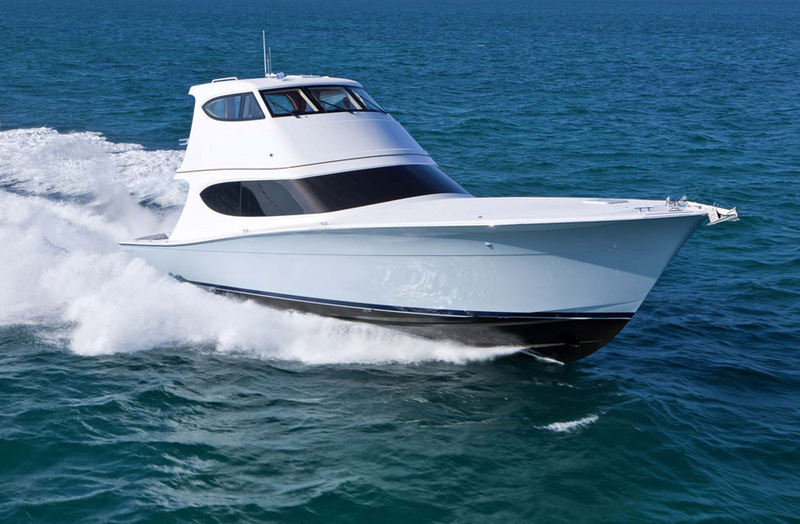 Because of this, the GT63 has only a 5-foot draft which is shallower than most other 60-foot sportfish. 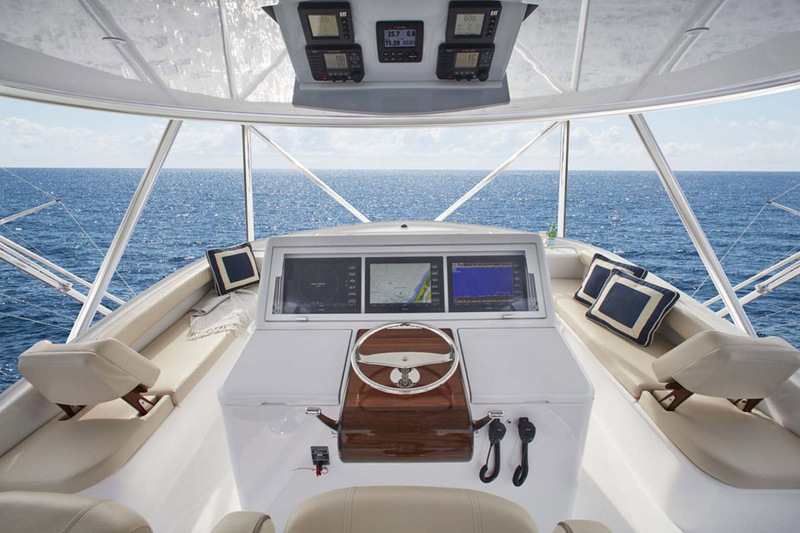 The cockpit of the Hatteras GT63 is an angler’s dream with many toys hidden in compartments and drawers. 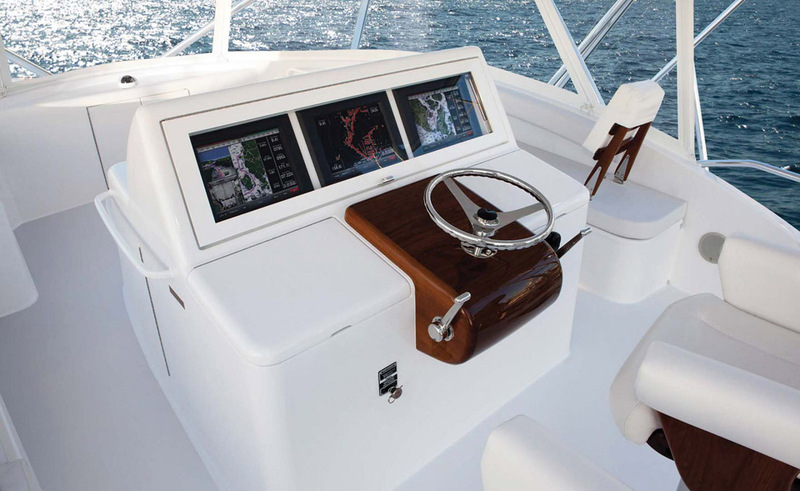 The 173 square foot cockpit has a seemingly endless amount of storage options for rods, gaffs, and tackle all within reach, as well as a drop down remote control station. 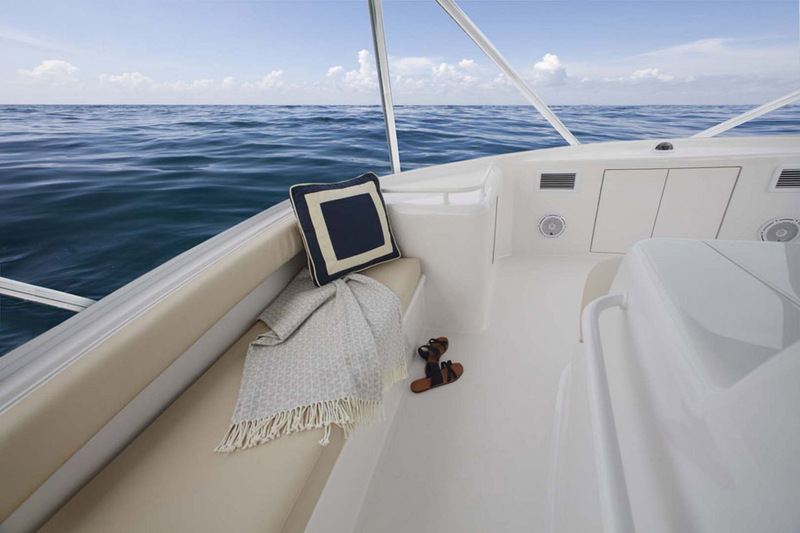 Other fishing features include an optional transom livewell, Eskimo ice machine, and lots of insulated fishboxes. 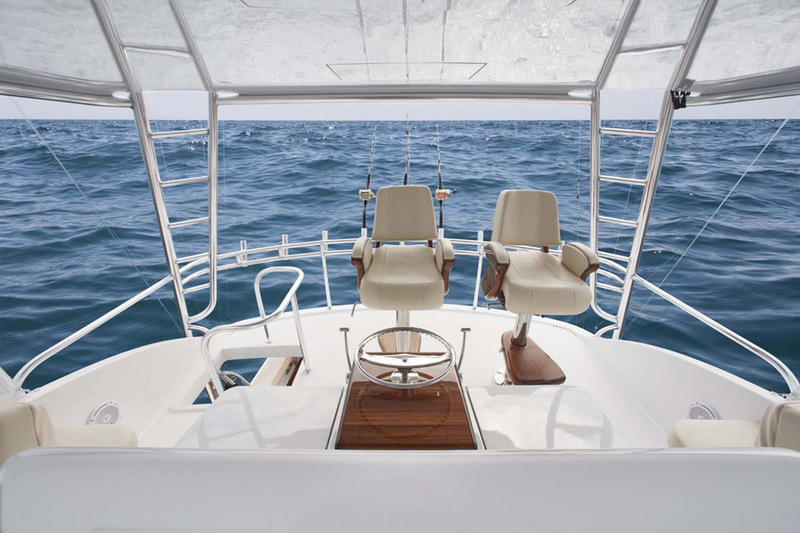 And no Hatteras sportfish would be complete without the observation mezzanine. 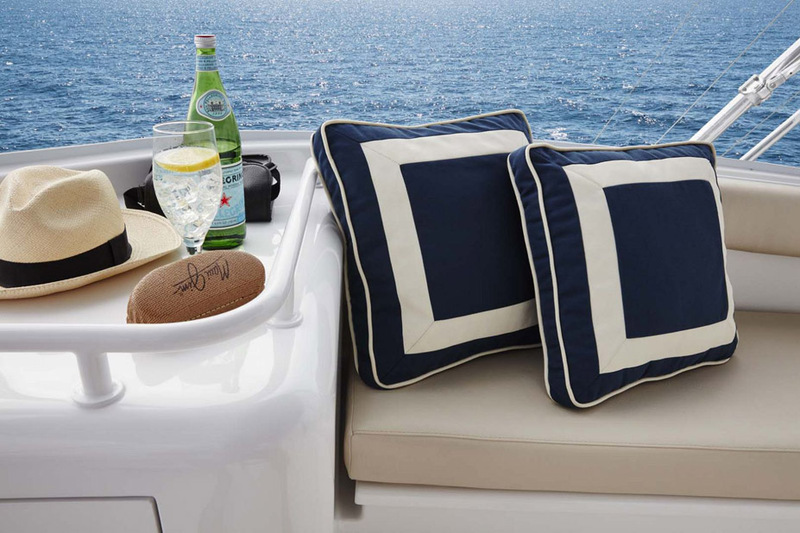 Guests on board will enjoy sitting in the shade and air conditioning on the comfortable cushions while watching the action in the cockpit. 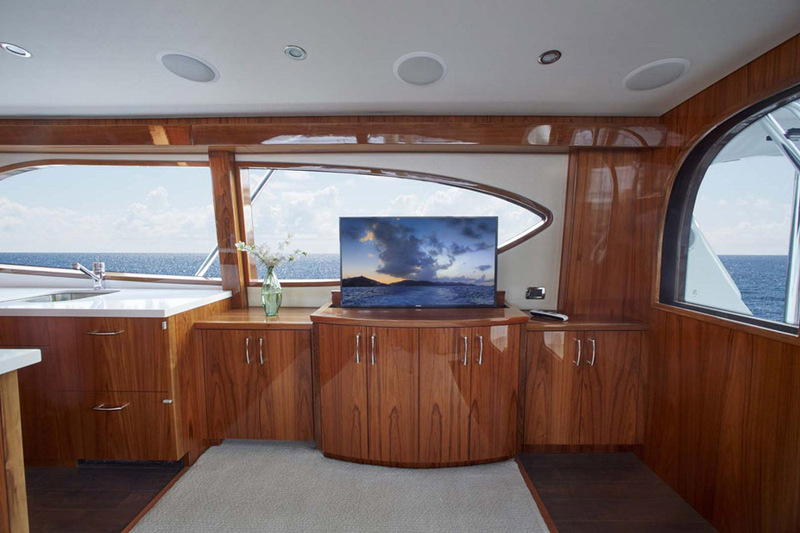 The salon and galley are a remarkable living space that is benefited from the GT63’s 20-foot beam and extra wide windows. 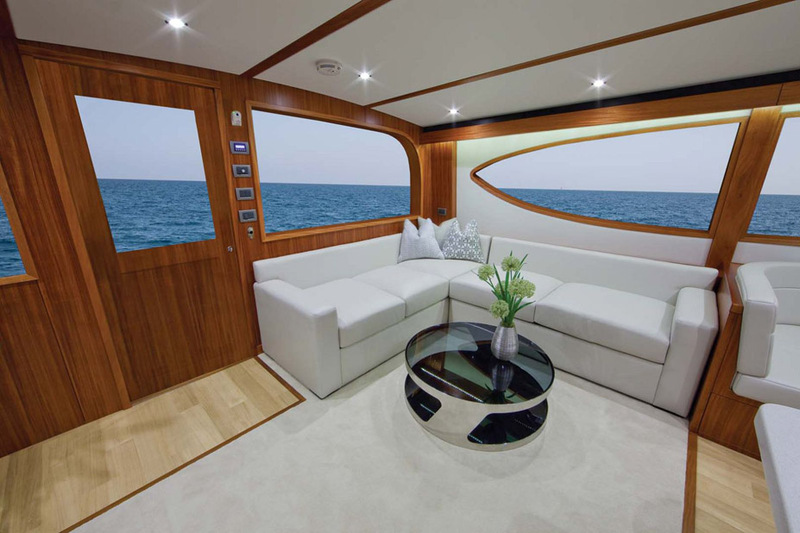 The L-shaped leather sofa provides a comfortable place for guests to sit and watch the flatscreen television. 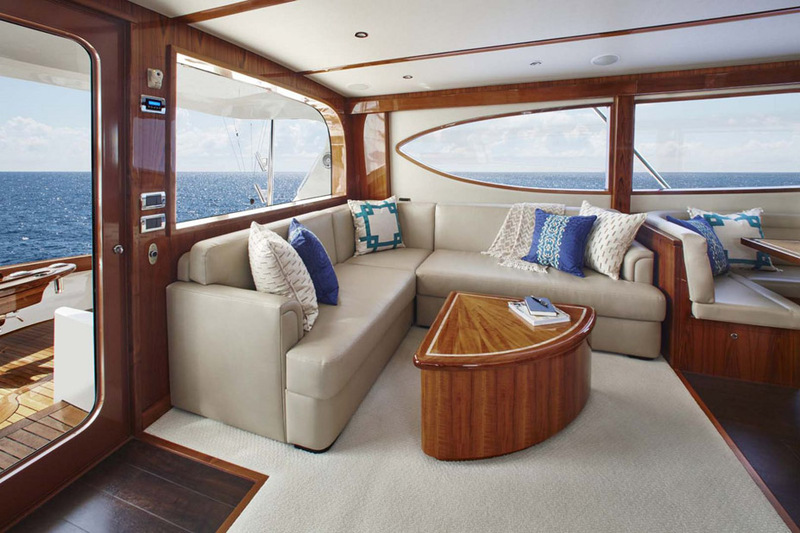 The U-shaped settee sits around a teak dining table that fits five adults or more if chairs are brought up. 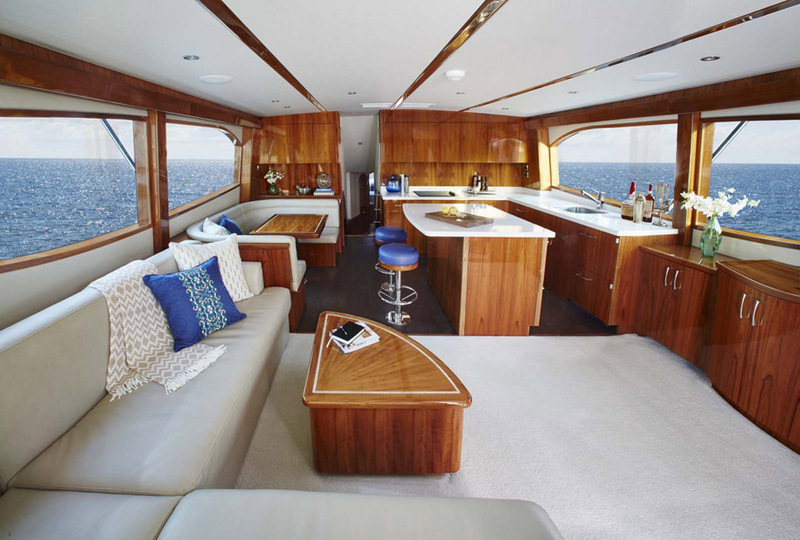 This layout combines the living and dining spaces of both rooms wonderfully so no one ever feels left out of the conversation. 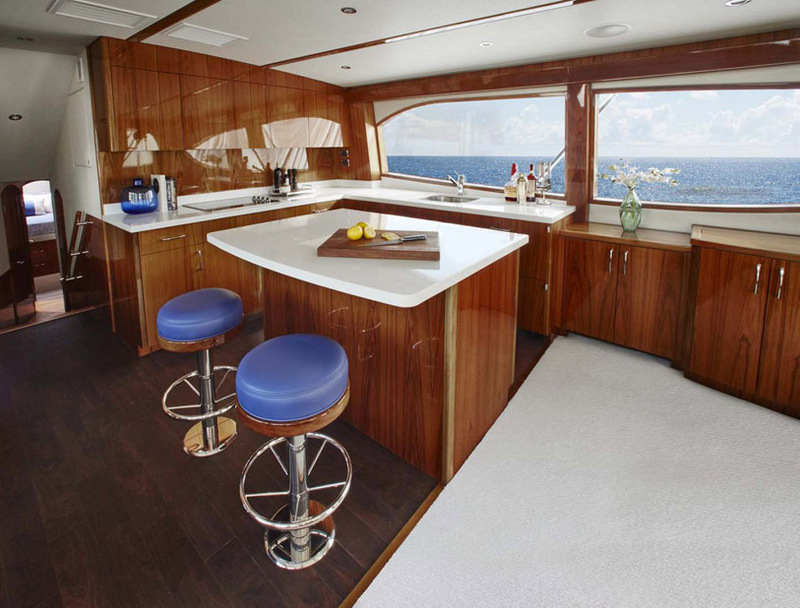 The galley is beautifully designed and accented with granite countertops and lots of refrigeration, storage, and cooking amenities. 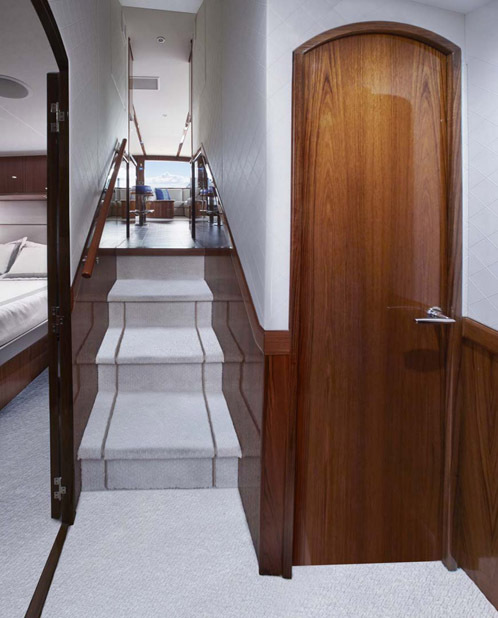 Moving forward through this space is the start of the staterooms. 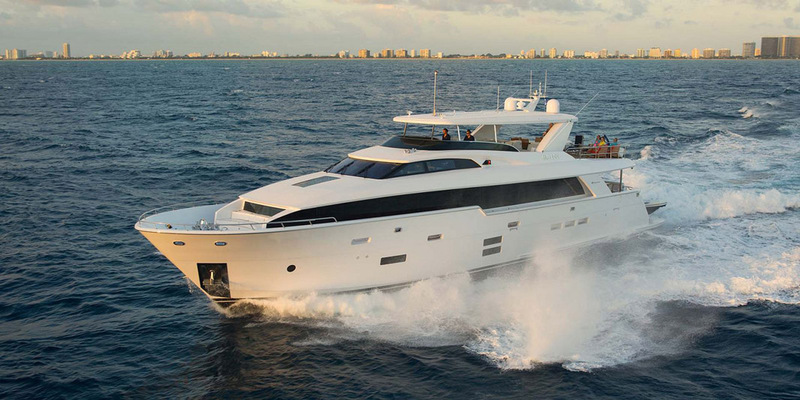 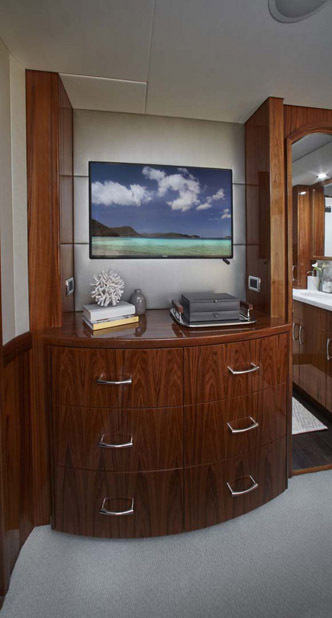 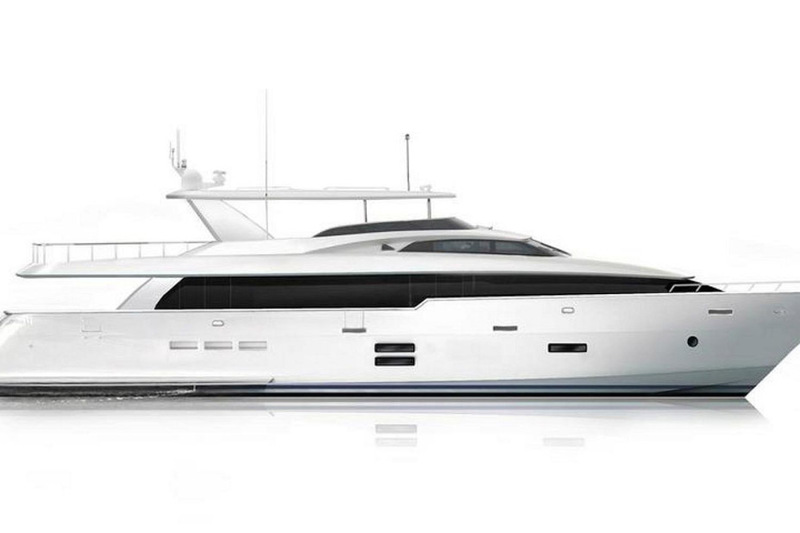 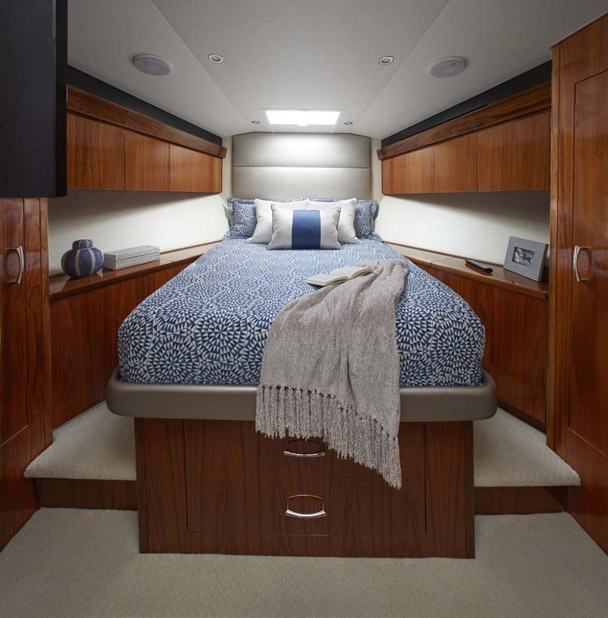 The Hatteras GT63 has the option for either three or four staterooms on board with three heads. 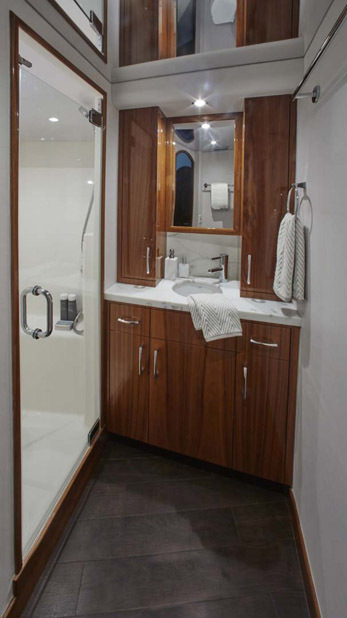 The master suite has a queen-sized berth with ample storage throughout and its own private head with shower stall. 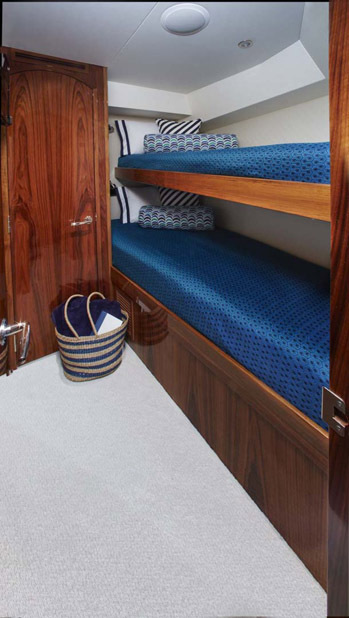 Additional guest staterooms are designed for another queen-sized berth in the VIP or over—under bunks in the other staterooms. 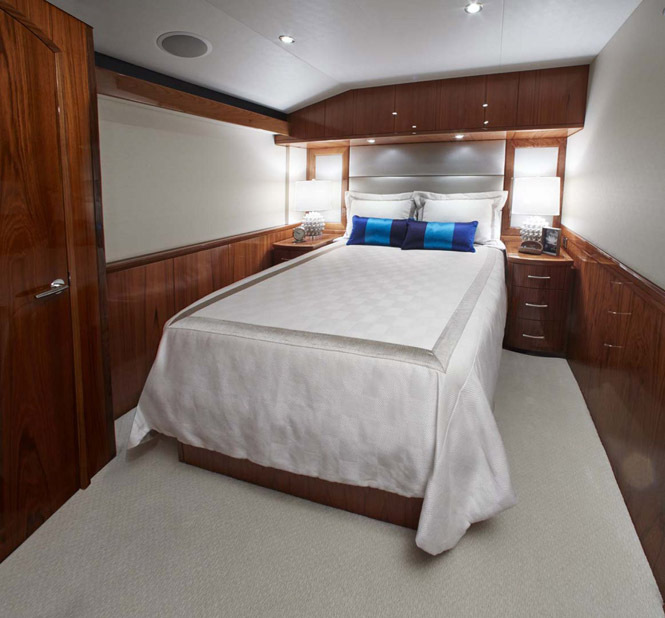 There is an additional galley on the lower level as well for the crew quarters. 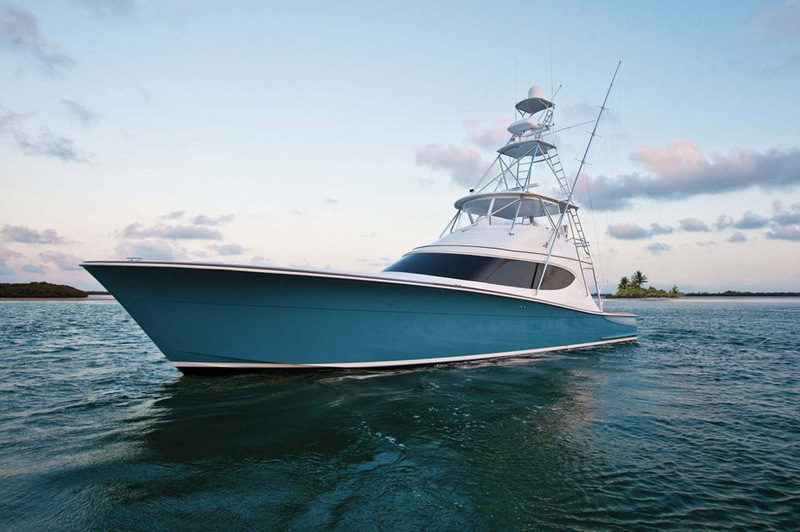 If you’re interested in learning more about the new Hatteras Yachts GT63 Convertible or Enclosed Bridge Sportfish, contact your United Yacht Sales representative today.